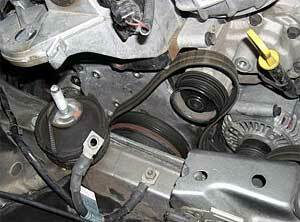 Below are instructions for the Mini Cooper S Supercharger Pulley Upgrade Kit, Part Number NME5041 . 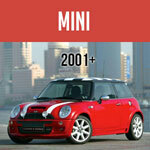 These instructions are for MINI Cooper models Hardtop (R53) 2002-2006 and Convertible (R52) 2005-2008. 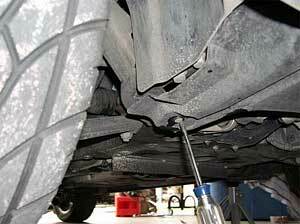 Please take all necessary precautions for working on and under the vehicle. 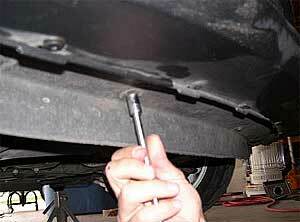 Mini Mania is not responsible for any damages incurred during the installation of this part. 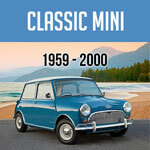 Mini Mania recommends professional installation. Before starting, open the rear hatch and disconnect the battery with a 13mm. Leave the hatch open. 1. Jack up the car until the stand will fit under the factory jack point without any extension (to keep the car relatively low). 2. Remove the intake. 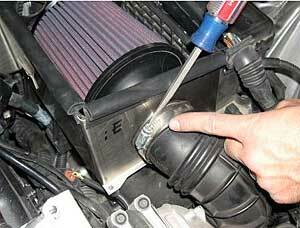 Start by removing the battery terminal from the side of the airbox - it just clips out. 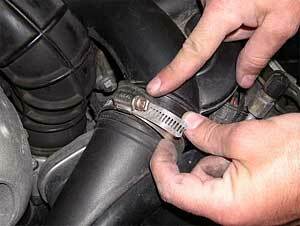 Remove the clamp at the intake boot. Remove the two #25 torx bolts at the base of the intake heat shield (or if it is the stock box, these same two bolts hold the top of the airbox in place). 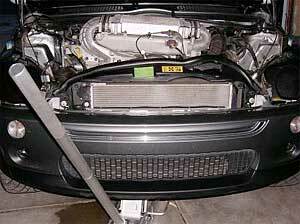 Remove the intake or the panel filter and airbox top (depending on what you have). 3. Remove the ECU and lower airbox half. Remove the ECU cover (it just has two tabs on each side that squeeze together and pull off), then remove each of the two plugs. These are a little tricky - they have tabs on the end of the plug that pull away from the plug which forces the plug up and off. It's easiest to use a small screwdriver very carefully to pull these tabs away from the plug. ou can see the tab just under my left hand on the larger of the two plugs. Remove the 10mm bolt that holds the driver side of the airbox down. 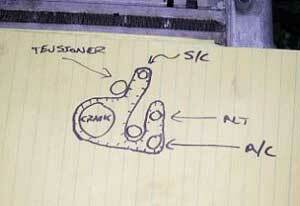 There is also a small steel bracket holding a wiring loom that is attached with this same 10mm. 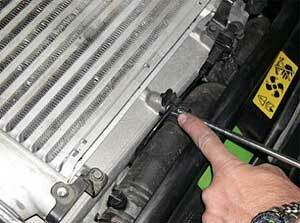 You will need to move this loom slightly out of the way to remove the airbox. Now remove the clamp on the snorkle to the airbox. You will either use a standard screwdriver if you have replaced the clamp, or the factory removal tool if you still have the stock clamp (you can also remove the stock clamp with a small screwdriver and replace it with the screwdriver and small pliers). 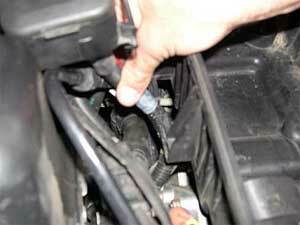 Press down on the tab inside the bottom of the airbox that holds the snorkle in place and pull it out of the car. 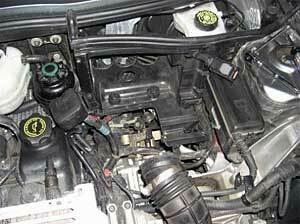 Remove the wiring to the battery terminal from the lower airbox half. You can now remove the lower airbox half by pulling back and then out. Here's what it looks like with the box removed. Note the two small rubber mounting bolts at the bottom rear of the partition. The box is molded on the underside to fit into these mounts, which is why you had to pull toward the front of the car before you pulled up and out. 4. Remove the skid plate. There are two phillips head screws, one on each side (they are like dzus fasteners). Then, remove the three 10mm bolts in front of the lip. Now you can pull the skid plate out by tugging aft then down. 5. Remove the lower motor mount 16mm bolt. 6. 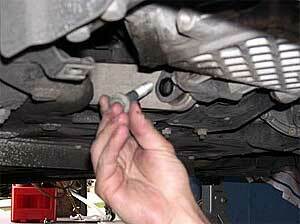 Using a small block of wood, line up the jack with the power steering fan under the drainplug. 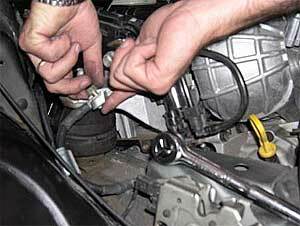 Being very careful not to interfere with the power steering fan, jack up until you are resting the jack firmly on the motor. 7. Remove the driver side 16mm motor mount bolt. It helps to wiggle as you are pulling it out, and jacking slightly may help as well. It is a little bit of an art, but once you get the hang of it, it is pretty easy (and it is the same thing threading it back in - you get good at it by just wiggling and jacking the motor at the same time). 8. 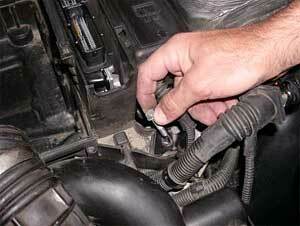 Remove the 10mm clamp bolt holding the wiring loom and radiator hose to the intake manifold. 9. Remove the 13mm ground bolt from the passenger side motor mount. Be careful to hold the bottom of the bolt to prevent it from falling out when you pull the nut off. 10. I slide the regulator off its bracket to gain more room for the tensioner tool, but you don't really have to. Remove the quick disconnect fittings and use a screwdriver to push the tab on the bracket in slightly and slide it off toward you. 11. There are three hoses attached to the vibration damper bracket. These just pop out of their respective holders. 12. Remove the vibration damper bracket 16mm bolts - the front one is shorter than the rear (for reassembly). 13. 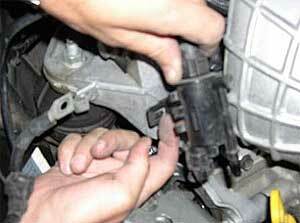 Using the 18mm wrench or deep socket, remove the passenger side motor mount nut. 14. 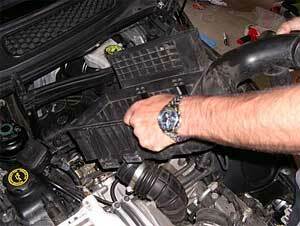 Now, being very careful in several places, slowly jack up the motor. 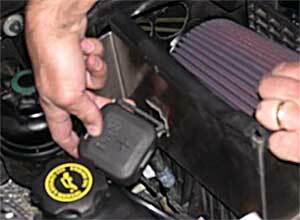 Pay special attention to the coil pack plug, the throttle body, and the power steering fan. Watch all of the hoses and wiring as you go up incrementally. This is the riskiest part of the job, so pay very close attention. 15. 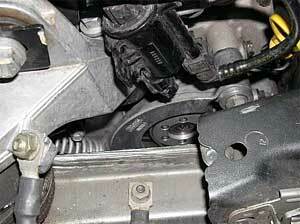 Using the belt tensioner tool, remove the tension on the belt and pull the serpentine belt off of the idler gear. The pulley tool is just a big lever with a pin on the end that fits into the two holes in the tensioner itself. 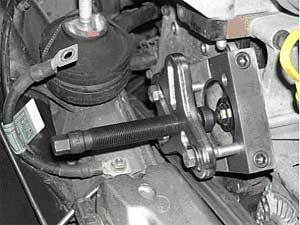 The lever fulcrum is the forward 16mm tensioner mounting bolt. 16. 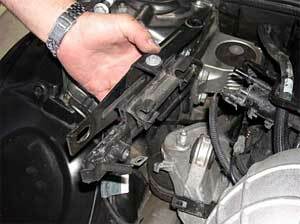 Remove the belt tensioner. There are four bolts, two 10mm and two 16mm. The rear 16mm is the whiter of those two bolts in the fuzzy pic. 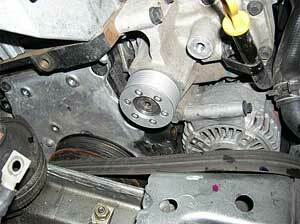 Note the two holes where the tensioner tool is inserted. Now you have access to the pulley! MEASURE THE CLEARANCE FROM THE BACK OF THE PULLEY TO THE SUPERCHARGER HOUSING. YOU WILL NEED THIS MEASUREMENT TO ALIGN THE NEW PULLEY. 17. 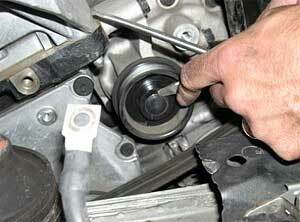 Install the pulley removal tool. 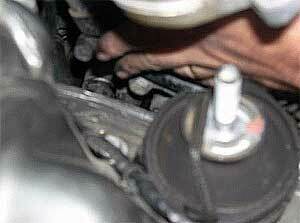 Start by taking the plastic center cap out of the s/c shaft. It helps to get the lip out slightly with the blade of a standard screwdriver, then it will just thread right out like a bolt by hand. Install a 13mm bolt into the center of the shaft. Slide the two halves of the removal tool over the pulley and tighten the allens. 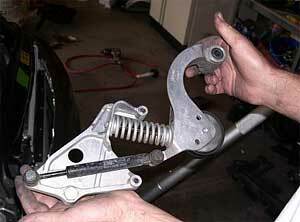 Photo below may show a different shaped pulley removal tool. Now install the crow's foot puller onto the removal tool. Using a ratchet on the end of the puller, wind the pulley off. This is a very effective and easy way to get the pulley off. It requires no drilling or cutting, and has worked everytime without a hitch. 18. 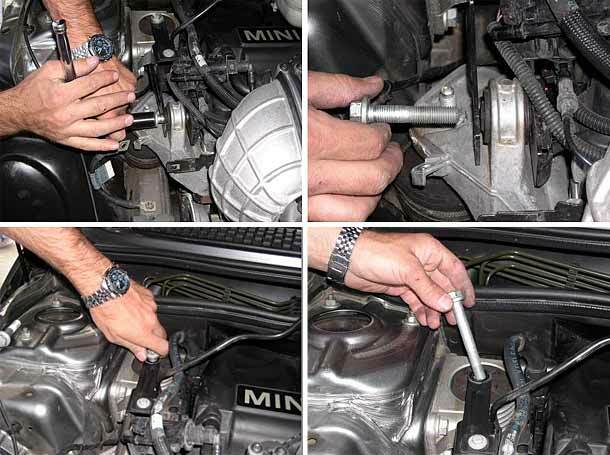 Once the pulley is removed, you can install the Mini Mania 3-piece pulley. Follow instructions from the pulley to prevent the pulley from 'moving' as you tighten the bolts to spec. Align the pulley to the same dimension you measure in step #16. Pulley shown may look slightly different than the actual 3-piece pulley. 20. Slowly lower the car onto the passenger side motor mount bolt. Once you get the nut started, place a stand with wood under the gearbox and slide the jack more to the center of the motor/gearbox. 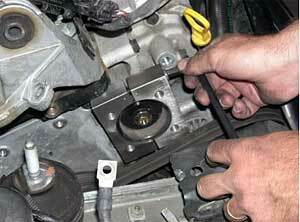 Now jack it up slightly and use the wiggle jack method to get the other motor mount bolt started. After that, it's just a matter of reinstalling everything. 21. Reinstall the vibration damper bracket (two 16mm bolts - long bolt to the rear of the car) and the associated hoses by snapping them back into place. 22. Reinstall the regulator and quick disconnect hoses. 23. Reintall the 13mm ground strap bolt. 24. 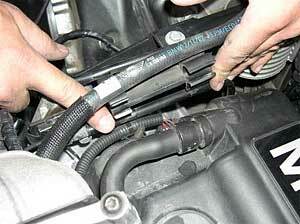 Reinstall the 10mm hose/wire loom clamp bolt. 25. Reinstall the airbox. When you are putting in the lower half of the airbox, make sure you lower it into position before sliding it back into the rubber mounts. It helps to take a look at the underside and figure out how the rubber mounts fit into the bottom of the airbox. You can feel the box and rubber mounts to be sure they are attached. 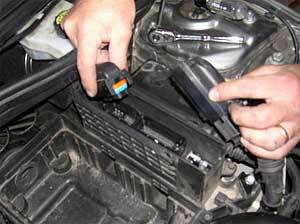 You use the tabs on the ECU plugs to reattach them. Make sure they are fully extended, line them up on the associated plug, then slowly close the tab and it will pull the plug onto the ECU. Replace the ECU cover by pressing it into place. 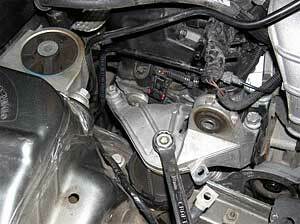 Reattach the 10mm forward bolt on the airbox - don't forget to put the bolt through the wiring loom bracket too. Reattach the snorkle by presing it into the lower airbox half and lining up the pin on the snorkle with the female receptacle. Reatach the snorkle hose clamp. 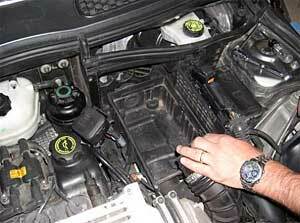 Replace the intake with the 8mm and #25 torx bolts. 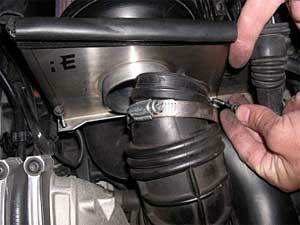 Don't forget to reattach the intake rubber boot and snug the clamp. 26. Reattach the 16mm lower motor mount bolt. 27. Put the skid plate back in place with the three 10mm bolts and the two dzus type fasteners (phillips head). 28. 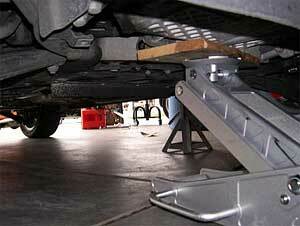 Remove the jack stands and lower the car. 29. Reattach the battery terminal. 30. Turn the ingnition key on for 10 seconds to reinitialize, then start the car. Check to see that nothing is askew. 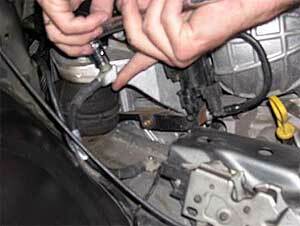 Listen for belt noises, look at the belt alignment, check for any leaks, etc.